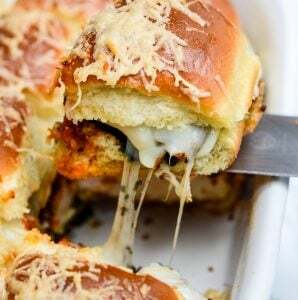 Whether you’re tailgating, hosting a party, or just looking for a tasty sandwich, these Pesto Chicken Parmesan Sliders are drool-worthy and perfectly cheesy! For the longest time, the only sliders I ever pictured were from White Castle. Over the years, as they have become more popular, I’ve come to appreciate that almost any good comfort food can be turned into a slider. Today’s recipe for Pesto Chicken Parmesan Sliders is no exception. Instead of pasta, they’re served on buns. As an added bonus, they have aromatic pesto and fresh mozzarella for a delightful boost of flavor. Want to cut down on the time it takes to make it? Don’t worry, you can get the tomato sauce, pesto, and chicken all ready-made (or easily reheated) from the grocery. A perfect game day appetizer is at your fingertips. These Pesto Chicken Parmesan Sliders can be made extra fancy by brushing up on these cooking techniques and making everything from scratch. How To Pan-Fry. Get the extra crispy crust on the chicken by mastering pan-frying. Find out everything you need to know from how to stay safe, to how to clean up the splattered oil here. Tomato Sauce. This is the recipe for one of the five french mother sauces: tomato sauce. The pork renderings and deep flavor in this sauce really elevate these sliders to a new level. Pesto 101. Get my favorite pesto recipe as well as tips for making it in a mortar and pestle or a food processor. If you have leftovers of these Pesto Chicken Parmesan Sliders, they’ll keep in an airtight container in your refrigerator for up to three days. The biggest difficulty with them, is that the buns begin to get soggy the longer they’re in there. Place the sliders in a lightly oiled pan and cover it with aluminum foil. If you brush the slider with some fresh butter and add a little bit of parmesan cheese on top, it will help make the Pesto Chicken Parmesan Sliders seem more fresh. Additionally, if the bottom bun has gotten too soggy, you can reheat the sliders in a preheated cast iron pan; it’ll help crust them up a bit. Just be careful that you don’t burn yourself putting them into the hot pan. The real tip for success with these sliders is mastering the thickness of the chicken when you’re flattening it. The more precise you are, the more evenly it will fry. This also prevents it from overcooking or from having large bumps in your sliders. If you would rather, you can substitute the chicken for frozen breaded chicken that you bake off prior to cooking to save you time. Also, these sliders are incredibly filling. My husband, who normally can eat half a pan of sliders himself, stopped at two. 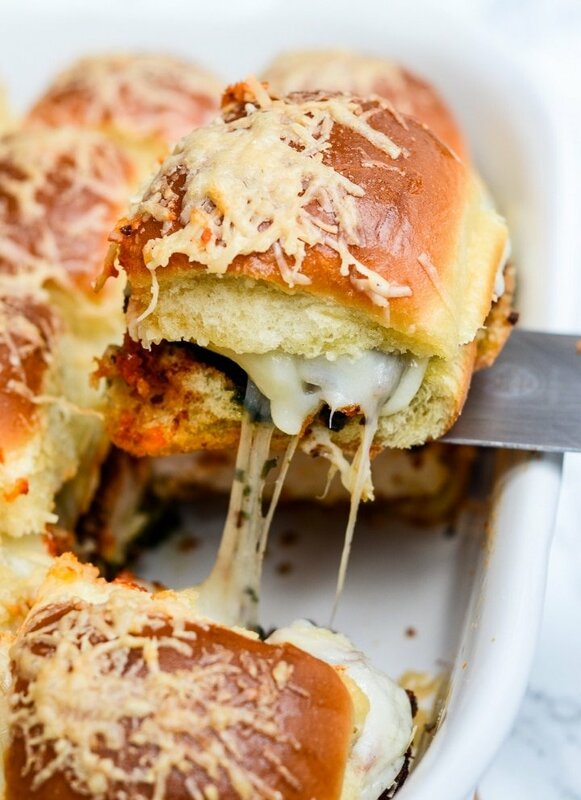 Get your free printable grocery list for this Pesto Chicken Parmesan Sliders recipe HERE. This grocery list has everything that you’ll need to make this Pesto Chicken Parmesan Sliders recipe. To make grocery shopping simple, each ingredient is listed in easy-to-find grocery store amounts. If there is no amount specified, that means that you can buy the smallest (or largest) container available and still have plenty left over. Whether you're tailgating, hosting a party, or just looking for a tasty sandwich, these Pesto Chicken Parmesan Sliders are drool-worthy and perfectly cheesy! Using three different pans, separate out the flour into one, the eggs into another and the panko bread crumbs, Italian seasoning, salt and pepper into the the last. Use a fork to scramble the eggs and set aside. Using a meat mallet (or the back of a pan covered in plastic wrap) smash the chicken breasts until they reach about 1/2" thickness. Pour the oil into a heavy bottomed pan and put the heat over medium high. While the pan heats, coat one of the flattened chicken breasts in the flour, then transfer it to the eggs and coat both sides with the eggs. Lastly, transfer the chicken to the panko and make sure the chicken is throughly caked. Once the oil has gotten hot enough that a drop of water sizzles when added, carefully add in the chicken. Cook for 5 minutes or until the breading is golden brown and flip and repeat on the other side for another 5 minutes or until chicken is cooked through all the way. Repeat steps 3 and 4 with all three chicken breasts, adding oil to the pan as necessary to continue frying. Once the chicken is cooked, transfer it to a paper towel lined plate and set aside. Spoon a large spoonful of the pesto onto each of the bottom buns and spread around as needed. Layer the chicken breasts on top, followed by the sauce, sliced fresh mozzarella, and the top buns. Brush the tops of the sliders with the melted butter and sprinkle the parmesan on top. Cover the pan with aluminum foil and bake for 10 minutes. Remove the foil and cook an additional 5 minutes, or until the cheese has melted and begun to brown. Remove them from the oven and let the sliders sit for 5 minutes before serving. You could put just about anything on a slider bun and I’d be a happy girl. Love this recipe! Simple and delish. Those crispy bits of cheese on top are my fave. Oh, and can’t wait for the Fire Roasted Jalapeno Cheese Ball!!! Mackenzie, these look beyond delicious! LOVE pesto and these chicken sliders look amazing! Would be perfect for the Superbowl! Thank you Jessica! I could eat these every day, but they would be especially fantastic for the Super Bowl! YUMMM, these are my kind of sliders. 🙂 Pesto + chicken parmesan go so well together. Perfect timing for the super bowl! So good for the Super Bowl! They have something for everyone! 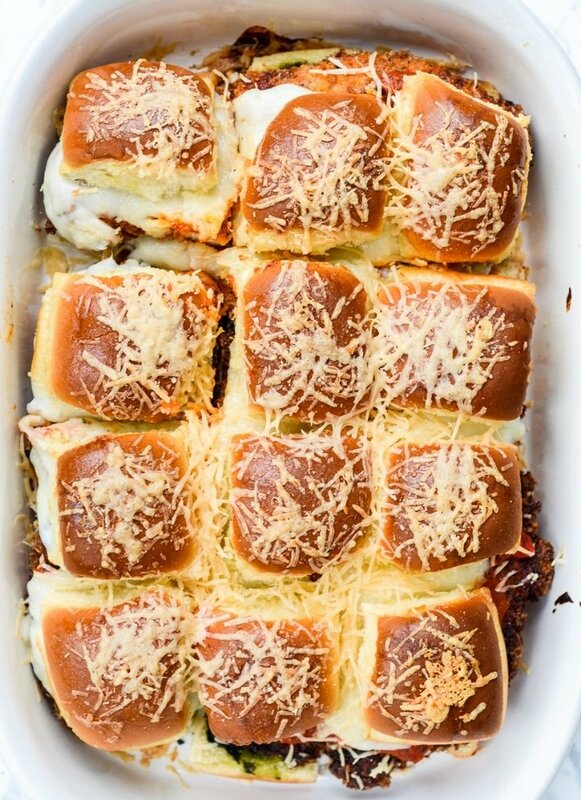 Yum yum yum on these…made me hungry for something cheesy just looking at your pretty photos! I totally have a weakness for this kind of food, too! I’m so glad you got to check it out and I hope you get to make it! This is great! I love the techniques on cooking and the tips for storage. Thanks so much for this. I’m so glad you enjoyed it, Tina. It’s such a great recipe! I just can’t say enough about these sliders! The crispy chicken and pesto have me drooling. It’s such a good recipe for feeding your comfort food cravings as well as feeling a bit more upscale. I love how simple this dish is! My mom is hosting super bowl this year…I’m going to forward this to her! It would be perfect for game day! This is absolutely perfect for game day, and I love how it can be as upscale or as simple as you want it to be! This is such a good recipe for a party! Plus, it’s surprisingly filling, so you don’t have to make as many additional dishes. WANT! I love sliders and pesto. These are perfect! Trying out next weekend. They are so delicious! I’m so glad you’re making them! Girl, I think you just took sliders to a whole new level! Or chicken parmesan… Or BOTH! All I can say is that I can’t WAIT for an excuse to make these! I love how just the addition of a simple ingredient like pesto can elevate a dish to a whole new level! I hope you love them, Claire! These look so so so good. We don’t have football in the UK but I’m gonna make these and pretend anyway! These are definitely worth pretending for, Debs. I hope you love them. Me too, Kristina! I could easily eat the whole pan of these!